With the start of a new financial year businesses are putting operational costs under the microscope. They may be surprised by the amount of money they can save simply by having their empty printer cartridges refilled at Cartridge World. The UK’s market leading retailer of refilled and remanufactured printer cartridges, is helping businesses and retail customers to make substantial savings by refilling their empty printer cartridges rather than purchasing expensive original manufacturers products. Last year Cartridge World saved its customers over £8.3 million and saved almost 2.5 million empty cartridges from landfill through refilling them. 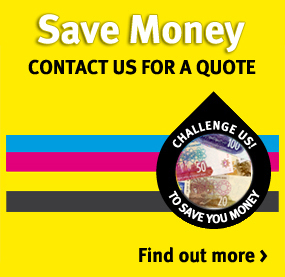 In addition to the savings made through the retail outlets Cartridge World saved UK businesses over £6.3million from their bottom lines. Business customers can also save time by using Cartridge World free collection and delivery service at participating stores, and of course all Cartridge World products come with a 100% money back guarantee for both business and retail customers.